There are many who used to be rootin' and rommin' e'ry day on their devices, but I think that overall, that movement has really slowed down. The environment of Android has become so mature that for most folks rooting/flashing is only for a very specific section of the user base who are looking for very specific features that they can't get elsewhere. 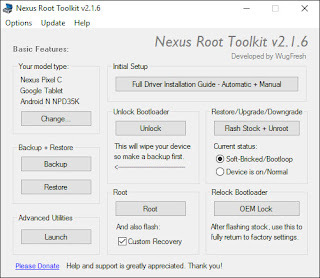 For whatever the reason, if you're still flashing some new ROMs or wanting root on your apps, the tried and true method of adb script commands feels a little ancient, so +Wug Fresh has built a great app to handle all of that and I've made many a use of the Nexus Root Toolkit. The latest offering now provides support for the Pixel C, and includes full support for Android N. So those users who want to try out the developer preview but don't want to get your hands dirty with scripts can give this a try. 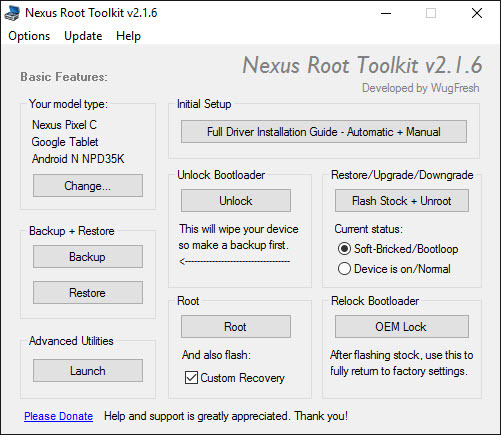 Do you still root your device?